An Illustrated Shell Command Primer « Adafruit Industries – Makers, hackers, artists, designers and engineers! Like the shell, Adventure‘s interface is made entirely of text. The shell is a lot like that game world, except that instead of a map full of rooms and objects, you navigate a computer’s filesystem and work with the files it contains. The filesystem, everything the operating system needs to boot up, run software, save files, take photos, etc. is organized into directories. We usually call these “folders” in the Windows and Macintosh worlds, but the concept is the same. 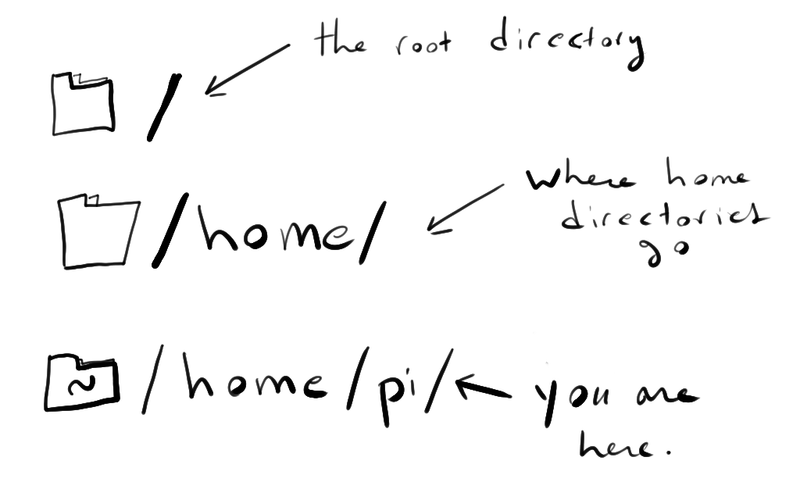 A directory is just a special kind of file that can contain other files, including directories. This one is a direct followup to What is the Command Line?, so if you’re looking for some context, you might want to start there or with the earlier What is this “Linux”, anyhow? The Illustrated Primer is meant to be a work in progress, and followup guides on more advanced topics are coming soon – let us know what else you’d like to see!